The below inquiry, concerning playing cards illustrating proverbs, was originally published in Notes and Queries, Number 58, December 7, 1850 - A Medium of Inter-communication for Literary Men, Artists, Antiquaries, Genealogists, etc. We provide it here as a tantalizing bit of information for playing card collectors. I have before me only four, out of what I presume originally consisted of fifty-two playing cards, unlike any I have hitherto heard of. 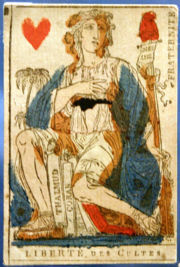 Each of them illustrates a proverb, which is engraved at the bottom of a pictorial representation of figures and objects, and the cards consist of the ten of diamonds, the ace of hearts, the seven of hearts, and the eight of spades: the number is in Roman figures at the left-hand corner, and the subject, a diamond, heart, and spade, at the right-hand corner. I will briefly describe them separately. The proverb illustrated by the ten of diamonds is "Hee's in an ill case ye can finde no hole to creepe out at;" and the engraving (upon copper) represents two men, with grey heads and in black gowns, in the pillory, surrounded by soldiers armed with halberds, partisans, spears, &c., of various shapes, and by a crowd of men in dresses of the seventeenth century. The ace of hearts illustrates the proverb "Look before you leap;" a man in a hat turned up at the sides is about to leap from a high bank into the waters, wherein two others are already swimming: in the background is a fifth man looking over the fence of a cottage. The seven of hearts has engraved at the bottom of it, "Patience on force is a medicine for a mad horse;" and it represents the female keeper of a brothel receiving whip-castigation at a cart's tail, a punishment frequently inflicted of old upon women of that description, as many authors testify: soldiers with halberds, &c., as before, march on either side of the cart, which at the moment is passing a house with the sign of the Half-moon hanging out from the wall by ornamented iron-work. The eight of spades is upon the proverb, "Two of a trade can never agree;" and in the engraving, a couple of fish-wives, who have thrown down their baskets of plaise, flounders, &c., are fighting furiously, while a man, behind, is obviously running away with something he has stolen from them: the background consists of gable-ended houses, part of a street. These cards came to me from an old relative, who very likely once had the whole pack, or deck, as it was formerly called; but I never could find more than these four, and I have been unable to meet with, or hear of, any others like them. From the costume and other circumstances, I am inclined to think that they belong to the period of the Civil War, or rather later; and I remember, some years ago, to have been shown twenty or thirty cards of the latter end of the seventeenth century, founded upon public events, one of them relating to the celebrated "Virgins of Taunton Dean," another to the Death of Monmouth, &c. I shall be personally obliged by any information respecting the cards I have described; and, since a distinct Query may be desirable, I beg leave to ask any of your readers, whether they know of the existence of any other cards belonging to the same set?